China's exports rose 17.7% in December, state media have reported, suggesting the country has overtaken Germany as the world's largest exporter. The rise, compared to a year earlier, breaks a 13-month decline in trade as a result of the global downturn. 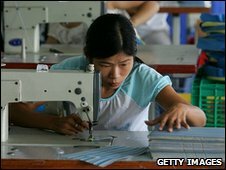 Xinhua said total exports for 2009 were $1.2tn (£749bn), but total foreign trade over the year was down 13.9%. Correspondents say the figures will lead to new demands from China's competitors that it revalue the yuan. Last year saw a continuing decrease in China's trade as the global economic downturn led to a fall in demand for its products. But in the last few weeks of the year, there was a far greater rise than forecasters had expected, with foreign exports reaching $130.7bn, up 17.7% on the previous December. China's General Administration of Customs (GAC) said exports overall in the year were $1.2tn, down 16% from in 2008, while imports were 11.2% down from a year earlier at $1.01tn. The politically sensitive total trade surplus was down 34.2% to $196.1bn. The figures suggests China will surpass Germany's export total for the whole of 2009, although this will not be confirmed until Germany's full-year data is published in February. A spokesman for GAC said the increase was "an important turning point" for the country. "It is safe to say now that Chinese exporters have come right through the period of weakness," Xinhua quoted statistician Huang Guohua as saying. The BBC's Chris Hogg in Shanghai says many of China's producers are low-cost manufacturers who assemble equipment such as i-Pods using foreign components. The latest figures are being seen as an indication that those manufacturers have proved resilient in the downturn and are benefitting as their customers restock, says our correspondent. But the figures are likely to lead to renewed complaints from China's trading competitors that its currency is undervalued, he added. Led by the US, they say it is unfair that China has been able to make its good cheaper by keeping the yuan weak, but Prime Minister Wen Jiabao has said China "will not yield" to foreign demands that it revalue the currency. Beijing has long said that it will not allow the yuan to trade freely until its domestic economy was strong enough to pick up any resulting decline in exports. The slowing decline in Chinese trade has also been taken as a sign that the country's stimulus package is working. 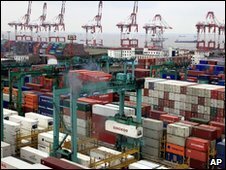 Beijing raised tax rebates on exports several times in 2009, increased tax refunds and improved export credit insurance.